Fishing for False Albacore is a group of relatively simple steps, but those steps are non-negotiable. 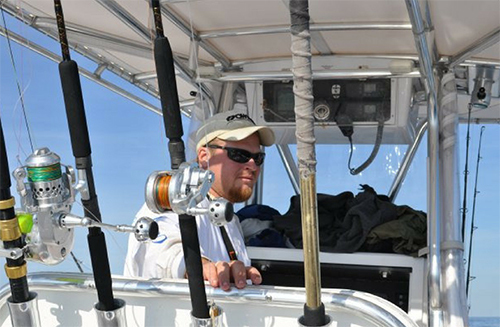 The first 3 things you need to have is light rods, heavy line and lots of muscle. Next you need to look for water to be in the 78-50 degree range and remember that the colder the water the bigger the fish, sometimes weighing up to 4-5 pounds. 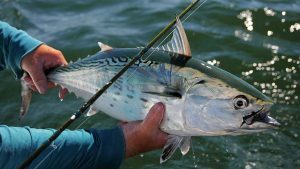 Late October and most of November is a great time for Albacore fishing due to more fish coming through the area. But remember, it’s not what the calendar says, it’s what the thermometer says. I rig up with 20 lb. Power Pro braid line with a 1’ to 2” fluorocarbon leader. The weight of the leader can vary. I prefer a 7’ fast action rod with a reel that has a good drag. When it comes to lures, I like the Cripple Herrings and the 6” Trout Killers with a ½ oz. jig head with my favorite colors being Ice Pink. Another one of my go to lures is the Mirro Lure #19 in the color #50. I’ve also found that the small Gotcha Plug with a silver body and pick head is a good choice. Once on the water, I start looking for the surface action. The Albacore are early feeders and that means I have to be on the water before sunrise to get the feeding grounds prior to the sun coming up. Look for breaking water of the bait fish and slowly approach the moving pod. I also have my rod in my hand and ready as I quietly move closer to the feeding frenzy. I put the engine in neutral and start casting the edges of the feeding. Before you know it your reel starts to scream and the fight is on. Make sure that you manage your drag to slow the fish down. It’s a great fight and the fish will likely make a number of runs so be ready with the drag. Keep his head up and the pressure on. Key points to remember are to not “run and gun” into the bait pod. This will only result in the bait diving and the Albacore being spooked. Manage your drag. 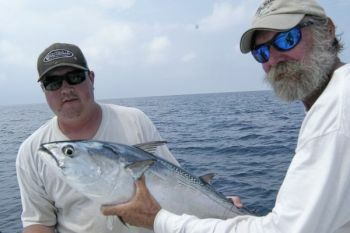 The False Albacore is a strong, fast fish and you lose control quickly without good management. Be there early. The Albacore feed early. Stopping on the way to the boat for breakfast will probably mean you won’t see or catch any Albacore that day.